Participants in this class will learn the basics of box construction and a variety of book forms. The selection of materials and forms will be in support of each one's collected piece or pieces that need that special place to reside. 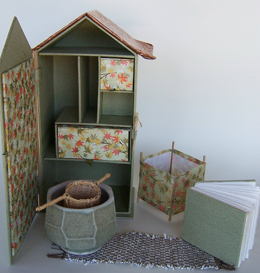 False floors, hidden drawers, shrines, and niches are all possible in this class that builds a home and journal for the small objects and stories we need to keep close. My art is narrative, a story retold with paints, pencil, collage and collections. Each work is a personal expression of time, place, and thought. It is what I call “evidence of experience” garnered from my writings, sketchbooks, and the things I gather that have meaning beyond their intended purpose. Feel free to contact me at www.sandywebster.com with any questions prior to class. Sandy Webster is an artist currently working in mixed media. She received her BFA with honors from Western Carolina University and her MFA from Vermont College. Her works have been shown in the US and internationally in solo and invitational exhibitions. She has been published in Fiberarts Design Books IV, V, VI and in several Lark/Sterling Publications, as well as in Handwoven, Shuttle Spindle & Dyepot, Textile Fibre Forum, and Cloth Paper Scissors. Sandy has taught, lectured, and juried throughout the United States, Canada, Australia, and New Zealand.